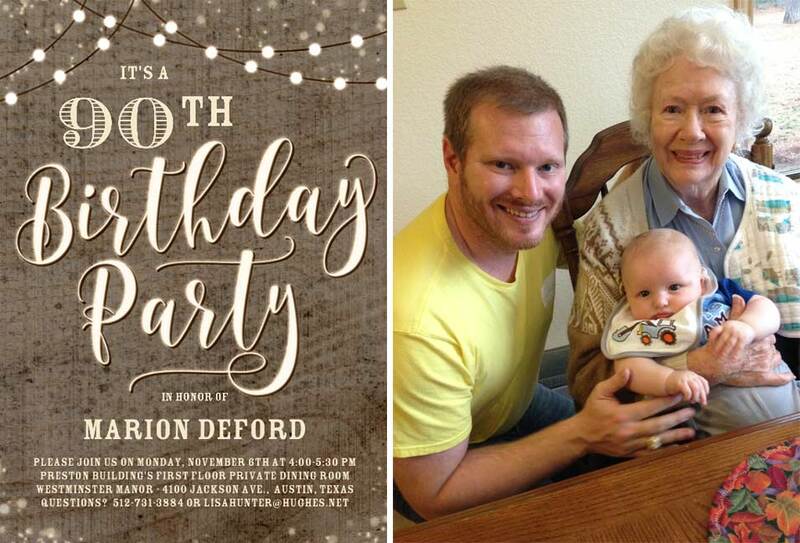 Daughter, Lisa Rich Hunter, shares the announcement of her mother Marion Rich DeFord's upcoming 90th birthday on November 6, 2017. On behalf of all Aramco ExPats, we wish Marion a very happy birthday. Marion lived in Dhahran from the early 1970’s until her divorce from Electrical Engineer, Bill Rich, in the late 1970’s. For 2 years, Marion worked for ARAMCO as a clerk in the ExPat Daharan office. Prior to their move to Arabia, the family lived in Kuwait with Aminoil for 10 years and in Venezuela with Mobil Oil for the 10 years prior to that. While living in Venezuela in Mobil Oil Camps, Marion had two children, Lisa and Stephen. No stranger to the oil industry, Marion's parents, John and Mabel Wier, lived in Venezuela and Columbia for many years, where John Wier was a pipeline Engineer with Mobil Oil Co.
Marion is a 1940’s graduate of the University of Texas in Austin. She graduated with a degree in English. She was a stewardess for American Airlines prior to moving to Venezuela to be with her parents. While there, she got a job with Gulf Oil Company as a clerk, met Bill Rich, and married. Marion loved living aboard in Venezuela, Kuwait, and Saudi Arabia, living in the oil camps, working for the oil companies, and experiencing other cultures and sites. In one very fond memory, Marion and Bill took a small aircraft flight to Angel Falls, Venezuela in the early 1950’s and met Jimmy Angel at the campsite. A memory they will never forget!. After Marion divorced, she moved to Austin, Texas where her parents had retired, and worked as a secretary in the BioMedical Engineering Department of the University of Texas. She met Ronald K. DeFord, a University of Texas Geology Professor, and they were married in late 1979. Professor DeFord passed away a number of years ago, after having shared many wonderful years together. Marion’s love of travel continued into her retirement years and she continued to travel all around the world, including a 45-day cruise around the world just a few years ago with travel companion Retired Col. William Gregory. They traveled on many other trips with her sister Marjorie Eason and Marjorie's husband, John Eason (who also lived and worked for the oil companies in Venezuela). A few years ago, Marion was also among several retired Aramcons who were invited on a bus trip to Waco, Texas to meet Saudi Crown Prince Abdullah as he landed for meetings with then-President Bush. In the receiving line to shake hands with Saudi Royalty, Marion was wearing her Arabic “name” necklace and the Crown Prince stopped to read it and said, “Hello, Marion", as he shook her hand. The next day, the Prince flew this fortunate group of Aramcons to the Houston Banquet on his private jet. Marion said as others have, "it was an absolute honor and highlight of my life to be included in that event. Crown Prince Abdullah was such a personable man, with such presence." Marion's children are Lisa Rich Hunter DH’73 of Smithville, TX, Austin area, and Stephen Rich of California.